Brakes from new guy - THE PORTAL HUB - Pinzgauers, Haflingers, Volvo 303s and more! I would like to introduce myself since this is my first real post. My name is Mark McClain from Georgia. I test drove a 1973 710m today and all looks good until I hit the brakes. They were very squishy and barely stopped. I am no mechanic, pretty mechanically inclined, but still no mechanic.....but I want to learn. The guy selling is certainly not. He has driven it, but it came with a farm he bought, so he tells me the brakes and clutch use the same master cylinder and it leaks. He added fluid, but the brakes were still scary, almost useless. Is this a no go or a fairly easy fix? Sorry for the rant, but Pinzgauers are hard to come by down here. I really want this one and don't mind buying a new master cylinder. Is this where you guys would start or somewhere else. I plan on restoring this one as much as I can and keeping it forever. I want to do it right the first time. First off, it's been over 15 years since I've been close to a gas Pinz.. Brake and clutch MC are not the same. spongy brakes are usually from air in the line, or a or some rubber hoses are rotting and expanding (ballooning)... If the brakes can pump up, the shoes can be out of adjustment or worn beyond limits ( also bad MC) , 710s have 2 1/2 slave cylinders in the fronts with 2 adjusters in each wheel. So if you do an adjustment, there are 4 for the front. With you saying it leaks brake fluid, there has to be air in the lines to start. Depending where and how it was stored on the farm, and how long, you may be looking to replace all the soft lines, master cylinder and slave cylinders (6)... That is the doom and gloom approach ... I like that better than hoping for the best and being be surprised by big money expenditure .. if it does end up less, you have money for more toys ... brakes are something you do not want to skimp on. Brake and clutch most certainly do not use the same master. The brake master you can see under the dash attached to the vacuum booster and the clutch master is directly behind the steering column tucked up under the dash, usually behind the wiring harness. Considering he has to add brake fluid, that would tell me the master is in need of replace/rebuild. At this time the replacements are the way to go as they are not all that expensive. Since it sounds like brake fluid has leaked into vacuum booster, I would consider changing it also. Contrary to what most people think a properly working pinz braking system works really well. You must consider that it is not a modern disc brake system but certainly is able to lock up the tires easily if all is in proper condition. The symptoms could also be an indication of fluid leaking at a slave cylinder (usually front) and contaminating the brake shoes. This will cause the shoes to loose their effectiveness at braking. All in all not a huge expense compared to other issues pinzgauers can have. I'm of the opinion to not enable on safety. You either understand the breaking system and have specific questions on how to improve, or you recognize that your handing off to a professional. The post reads like a professional is needed. Nothing special about the brakes in a pinzgauer - the parts are all available and it should be familiar to any good mechanic - especially anyone who has worked on medium duty type trucks. Give Swiss Army Vehicles a call to get a quote on the all the parts (other than the hard / steel brake lines and figure that is the top cost. You can certainly do it yourself too if you have the time and space to go through it step-by-step with the help of the forum and the manuals. Lots of good resources out there to help you learn. 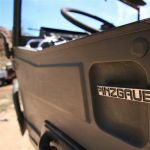 Doing it yourself is part of the Pinzgauer ownership (IMHO) as it is a very reasonable vehicle to work on for the DIY in a home shop. Thank you guys for the responses! Brakes are certainly on my top list of things I want for the Pinzgauer! I'm not sure if the learning curve is too big for me yet... we will see soon enough. Pretty service friendly vehicles, don't be scared. I have taken the front end out of mine and disaggregated the differential, installed a new piston and head.....the list of things go on. All things I had never done prior to owning the Pinz. It's fun to learn on these honestly. Time and patience are the only things mandatory for learning to work on anything. 1. If the brake pedal seems "low" (well adjusted brakes have pedal force in the upper third of travel) before you get force, or if you get force higher in the pedal travel upon pumping, then most likely the brakes are just not adjusted properly. Pinz brakes are not self adjusting - they must be manually adjusted to compensate for wear. This compensation may need to be done as much as several times per year if driven a lot; typically I do my trucks once per year. 2. Leaky wheel cylinders puts brake fluid into the wheels/drums/shoes. Contrary to expectations, this fluid usually causes the braking friction to INCREASE and often results in that wheel locking up during gentle to moderate braking. Replacing wheel cylinders is fairly simple. 3. 710 models are NOT well "balanced" during hard or emergency braking due to their high stance and short wheelbase. The rear wheels unload due to the weight transfer under braking and easily lock. Pulling the green lever to engage the front drive forces the front and rear wheels to turn at the same speed and actually transfers some of the braking force from the rear axle to the front. This is assuming you have the time and clearness of mind to think to pull the lever in time during an emergency stop! 4. As on ANY vehicle that is not relatively new, brake lines can be notoriously difficult to get free as they often rust/corrode until they are frozen in place. There is only one fitting on each wheel cylinder, two on the master cylinder, but there are two on each of the brake hoses (each end). This would be, in my estimation, the most difficult part of bringing the braking system back to factory standard condition. But once done (and done right) this truck would be set for many decades to come. Not all parts may need to be replaced; they must be evaluated (i.e., the hoses may not need replacing at this time). Get a good deal on the truck because of this issue, get it fixed and enjoy it! Buying a Pinz (and later buying a second one) has been one of the best things I have done in my life - the fun, the adventures, the people, have all been a great addition to my experiences.